Antonia was a delight. She was informative, pleasant and willing to alter the itinerary to suit the wishes of our group. Her English was excellent and her personality made our tour a memorable one. Absolutely wonderful tour with Eugenia! We saw so much of the island, while being comfortably driven to each location, avoiding crowds, and finding out of the way places. Highly recommended! Eugenia was lovely and well informed. We really enjoyed the tour and would highly recommend it. We were able to custom make the 5 hour tour to accommodate our schedule. We saw the island, visited the black beach and did a bit of shopping. A perfect day in paradise. Did a great job of taking us to the key places but also some wonderful sites away from the crowds. She gave us a perfect amount of information on the history , culture, environment of Santorini and did it in a very entertaining fashion. Would definitely recommend, especially if you are short on time like we were (arriving via cruise ship). Eugenia gave us the BEST tour of Santorini! She took us to all the places we wanted to see and knew exactly where to go for the best pictures! I am still raving about the archaeological site Akrotiri!! This is a must see and Eugenia is the tour guide to have as she is extremely knowledgeable about this site as well as the history of her country. We had by far, the best tour guide for our family trip! Thanks again Eugenia!! Eugenia was a wonderful guide for us in Santorini. She has a delightful personality and knew the best spots to take us based on what we wanted to see and do. She is very flexible in creating a tour so don't hesitate to tell her what you like. Highly recommended! This was the 4th tour we had on this cruise and she was by far the best. Very good English and willing to do anything we wanted. Her driving was excellent. I highly recommend her. We had an amazing experience touring Santorini! Eugenia was the perfect tour guide! She was very informative, personable, interesting, and delightful!!! We would highly recommend her to anyone touring Santorini. It was one of the most beautiful places we have ever visited. I don't believe their is any place in the world as beautiful as Santorini. And if your very lucky you might be able to get Eugenia Papadopoulou be your guide. She showed us her beautiful island giving us time to take as much as we could in, pampered us as to not get too exhausted with climbing , and even made sure that we had a fabulous lunch a a small local café, and a gelato, before we returned to the ship, It is a Day we will never forget, due to a guide that goes that little extra to make it special. We had an amazing day with Eugenia! Her enthusiasm was contagious. Her knowledge of history, geography, archeology and local information was extensive. She had a wonderful itinerary planned that gave us a great day seeing all that Santorini had to offer. She was accommodating to our wants and needs to make the day what we wanted. It was a perfect day!!!! Eugenia was a fantastic tour guide! She was warm, welcoming and made my young daughter feel completely at ease. Her knowledge of Santorini is superb and we all thoroughly enjoyed listening and learning about the history of this beautiful island. Eugenia always made sure that my daughter's needs were catered for and incredibly thoughtfully she bought my daughter a donkey souvenir. Her kind hearted and enthusiastic approach made the whole tour one to remember! I would definitely recommend! TOUR GUIDE RESPONSE: Thanks Sarah for taking the time to rate and respond. It was a pleasure to show you around Santorini! I had a really great with you and I really hope to see you soon! A big hug to all of you and especially to Macie! Eugenia's tour was one of the true highlights of our trip. 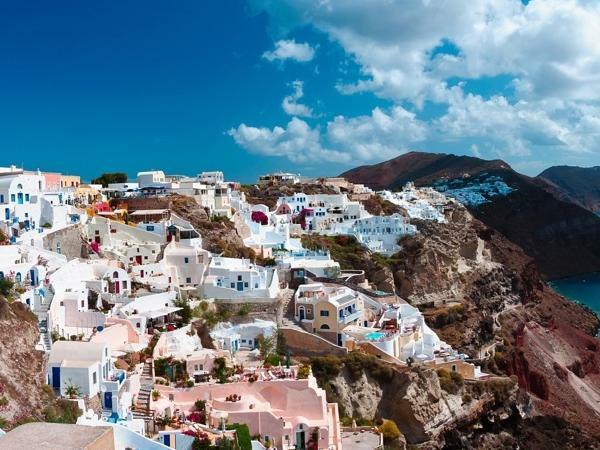 Not only is she highly knowledgeable about Santorini, she is also very kind,welcoming,and was eager to share the history and secret places to see on this beautiful island. She is perhaps the most professional guide we have ever toured with. If you're considering a private tour of Santorini, you can't go wrong booking her services. We felt very fortunate that she was available for us, and touring the island with her was an unforgettable experience. Eugenia was such a pleasant guide to spend our day with. She gave me easy directions to find her and options as to what we wanted to do and see. We visited a small family winery, a large winery and Oia. Beautiful! Long lines at tram when heading back so we decided to do the 600 steps down - just be aware the donkeys are coming and going on the stairs as well - could be very slippery and you have to be careful. TOUR GUIDE RESPONSE: Thank you so much Ann for your kind words! It was such a great pleasure!